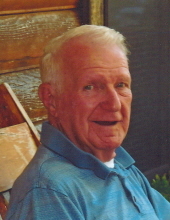 James “Red” Boyle, age 88, of Sullivan, Missouri, passed away on Monday, February 11, 2019 at Missouri Baptist Hospital in Sullivan. James “Red” Boyle was born on January 22, 1931 in St. Louis, MO, the son of George and Henrietta Boyle. At age 19, he honorably served his Country in the United States Army during the Korean War. After his discharge, Red moved to Sullivan and worked for Fidelity Telephone for some time. He was united in marriage to Edna Lee Witt in 1954. Sadly, she preceded him in death in 1984. Red also worked for Paramount Cap in Bourbon, Meramec Mines for ten years, and Monterey Coal Company in Albers, Illinois, from which he retired. Red was remarried to Reta Palmer Cowgill on May 15, 1992 at Eureka Springs, Arkansas. They lived full-time in their R.V. and were campground hosts in Missouri & Florida. They enjoyed being in the sun and having fun. Red will be lovingly missed and remembered by his family and friends. Red is survived by four children, Sandra Hinten and husband, Ronald, of New Haven, MO, Mary Hidritch and husband, Duane, of Rosebud, MO, Lisa Boyle-Weiskopf and husband, Corey, of Sullivan, MO, and George Boyle and wife, Rita, of Sullivan, MO; ten grandchildren, Karen Hinten of Union, MO, Brian Hinten and wife, Christie, of Rutherford, TN, Matt Hinten and wife, Jess, of New Haven, MO, Stefany Stahl and husband, David, of Sullivan, MO, Kathy Janes and husband, Branden, of Lonedell, MO, Lindsay Harris (Bob Mathis) of Hermann, MO, Lexi Hood and husband, Dustin, of Sullivan, MO, Veronica Weiskopf of Sullivan, MO, Dylan Hidritch of New Haven, MO, and Jessica Hidritch of New Haven, MO; ten great grandchildren, Emilee, Trevor, Cayleigh, Mady, Haylee, Lawson, McKinley, Bella, Jace, and Waylon; other relatives and many friends. He was preceded in death by his first wife, Edna Lee (Witt) Boyle; his second wife, Reta Palmer Cowgill Boyle; his parents, George and Henrietta (Kramer) Boyle; four brothers, Albert Boyle, Howard Boyle, Charles Boyle, and Oliver Jaccard; one grandson, Jason Harris; and one great granddaughter, Eliza Mae Hood. Funeral Mass will be Celebrated 10:00 AM, Thursday, February 14, 2019 at St. Anthony Catholic Church, with Father Paul Telken Celebrating. Burial will follow in St. Anthony Catholic Cemetery. Visitation will be held from 4:00 PM to 8:00 PM, Wednesday, February 13, 2019 at the Eaton Funeral Home in Sullivan. Friends may send online condolences to the family of Mr. Boyle at www.eatonfuneralhome.com. All arrangements are under the care of the Eaton Funeral Home of Sullivan. To send flowers or a remembrance gift to the family of James "Red" Boyle, please visit our Tribute Store. "Email Address" would like to share the life celebration of James "Red" Boyle. Click on the "link" to go to share a favorite memory or leave a condolence message for the family.